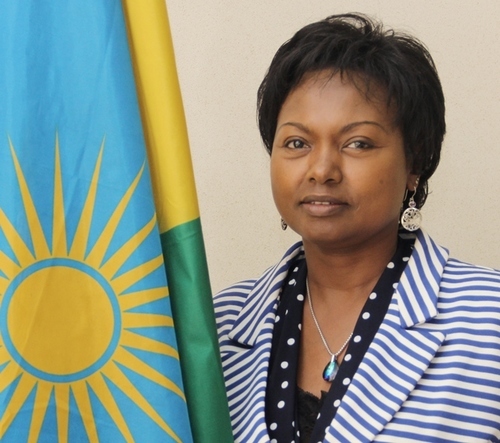 Professor Mathilde Mukantabana is the Ambassador Extraordinary and Plenipotentiary of the Republic of Rwanda to the United States of America and non-resident Ambassador to Mexico, Brazil, and Argentina. Prior to her appointment, Ambassador Mathilde Mukantabana was a tenured Professor of History at Cosumnes River College (CRC) in Sacramento, California from 1994 to 2013. She is also co-founder and President of Friends of Rwanda Association (F.O.R.A), a non-profit American relief association created in the wake of the 1994 Genocide against Tutsi in Rwanda. Since its inception, FORA’s dual purpose has been to expand the circle of friends of Rwanda and to support survivors of 1994 Genocide through a variety of initiatives and relief efforts. In addition, under the aegis of United Nations for Development Programs (UNDP), Ambassador Mukantabana started the academic program of Social Work at the National University of Rwanda in 1999, and as an Invited Lecturer taught a variety of subjects in their summer program until recently. Ambassador Mukantabana has been a passionate community organizer for several decades and was a co-founder of many associations and organizations whose main purpose was to promote a positive engagement and collaboration of the Rwandan communities in the United States of America with other groups and organizations for the benefit of their respective countries. She is an active Board Member of the Holocaust and Genocide Studies at Sonoma State University in California and belongs to many local and international organizations including the International Association of Genocide Scholars (IAGS) and the Organization of African Leaders in Diaspora (OALD) that she co-founded and for which she is currently acting as Chair of the Board. In her capacity as a college professor and as President of F.O.R.A., Ambassador Mukantabana was actively involved in various academic and civic engagements. She organized numerous domestic and international workshops and conferences on genocide and on the Rwandan experience. A featured presenter at several film festivals and an international in-demand speaker, Ambassador Mukantabana has won many awards attesting to her accomplishments including the 2012 Peace and Justice Award from the Center for African Peace and Conflict Resolution (CAPCR); Peace and Global Peace Award (on behalf of Friends of Rwanda Association) by Global Majority, 2012 and Crystal Apple Award for Best Instructor at Cosumnes River College, 2012. In addition, she was listed in Who’s Who among Professionals in America 2003. Fluent in English, French, Kinyarwanda and Kirundi, Ambassador Mukantabana holds a Bachelors degree in History and Geography from the University of Burundi as well as a Masters degree in Social Work with special emphasis in Community Organization, Planning and Administration and a Masters of Arts in History from California State University in Sacramento, California, USA.